In the tenth house, we find the flagpole waving to announce our presence to everyone. This is where we stand in the community and in the business world. 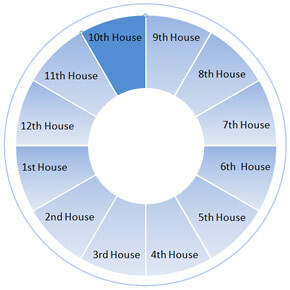 The tenth house describes the level of authority we have and how we deal with authority figures. Traditionally, that included you father, but now most astrologers think of it as the parent who is/was most prominent in our lives. For most people, this is the house of career...as contransted with the "job" we find in the sixth house. The word "career" talks about a lifelong calling. It involves managing big projects, coordinating activites at several levels at once. There is major responsibility for making decisions. And it requires the ability to be authoritative when necessary. The tenth house is the last of the angular houses, the one that completes the making of a chair that doesn't tip over. We cannot stay in the comfort of our home all the time. We must interact with society. This house shows how comfortable or uncomfolrtable we are with doing that.